As I’ve written about before, it’s important to develop power and explosiveness though methods such as medicine balls throws and plyometric jumps. But if we don’t develop strength as well, we’re missing out on half of the overall power equation. Developing the ability to apply force quickly with exercises like plyos and med ball throws is great, but if the amount of force applied is low the overall power output will be low, no matter how quickly you apply the force. So how do we develop the amount of force an athlete can apply? Strength training. And I’m not talking about things like body squats or high-rep lunges; female athletes need high-weight, low-rep strength work just like their male counterparts. Traditionally “male” exercises like heavy squats and deadlifts develop strength, which makes girls throw harder, swing harder, and run faster. For some reason, many strength coaches and trainers still hold onto the mistaken belief that girl athletes should be coddled and not allowed to lift heavy weights, when heavy weights may be exactly what they need. And just like with baseball players, softball players should spend time developing their hand and forearm strength with exercises like Farmers Walks and wrist rollers. Basically, softball players’ strength and conditioning programs need to be way less wimpy. for lack of a better word. Imagine that two high school softball players with similar skill sets are being evaluated by a college coach. One of the two athletes (Athlete A) follows a good strength and conditioning program, while the other (Athlete B) doesn’t. Athlete A has stronger legs, so she runs faster, and has more powerful hip rotation when she throws and swings. She has stronger hands and forearms, so the ball jumps off her bat. She has a stronger back with properly aligned shoulders, so she throws harder. And last but not least, Athlete A looks strong and athletic. Which of these athletes is more likely to get more attention from that college coach? Obviously, it would be Athlete A. Girls who possess higher levels of strength are simply better athletes than those who don’t. And since most softball players’ strength and conditioning programs (if they participate in one at all) are typically poor, the ones who train smart are at a huge advantage when it comes to winning college scholarships. So if you’re a softball player or parent, it’s a good idea to get started sooner than later. That is Sierra Stark and Jordan Cargile. Jordan is a high school senior who was named the Baltimore Sun Player of the Year last year, and who will be attending the University of Delaware next year on a softball scholarship. Jordan Cargile: good at softball, terrible at taking pictures. Sierra is an 8th grader who is one of the best young softball players in the state. She’ll be going to Catholic High next year and playing softball there. Barring some unforeseen circumstance, she’ll be a college softball player in 4 years. Both of these girls are extremely strong, and have been training for several years to get that way. 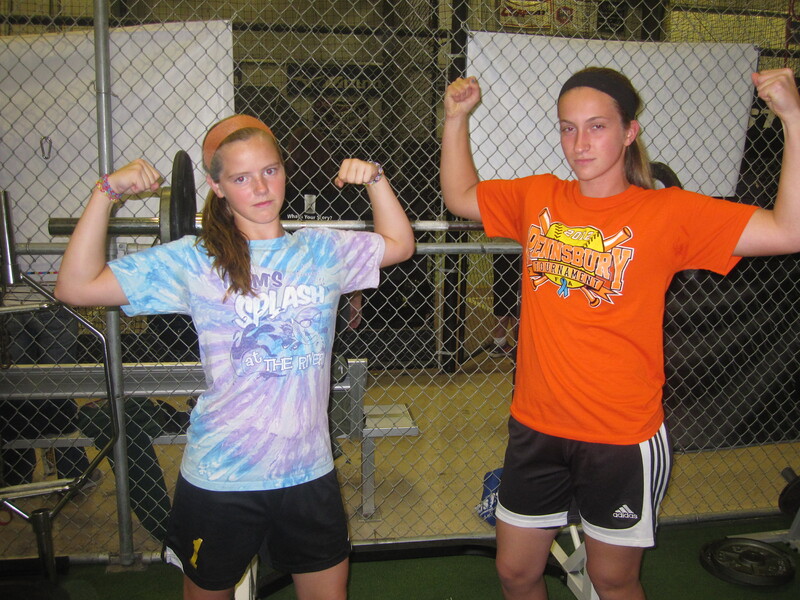 Is it a coincidence that they are two of the best softball players in the area? Not likely. If you’re a softball player and want to get a leg up on the competition for playing time and college scholarship money, it would be in your best interest to start a serious strength and conditioning program as soon as possible. Unstable Surface Training: Effective Strategy or Waste of Time?